President Trump says he does not object to France and Germany continuing trade with Iran. 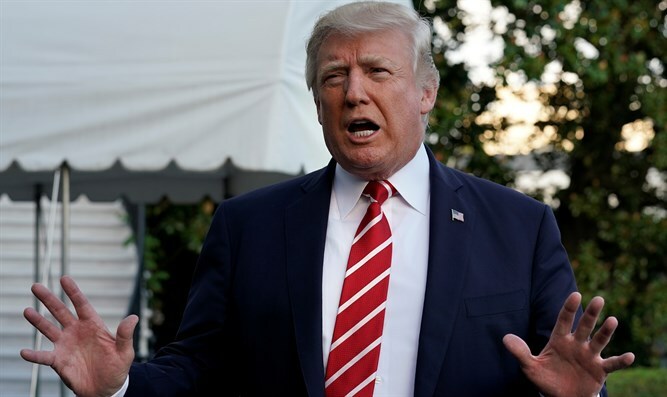 U.S. President Donald Trump on Sunday said he does not object to France and Germany continuing trade with Iran, despite his refusal to recertify the Iran nuclear deal. "I told them just keep making money. Don't worry. You just keep making money," AFP quoted Trump as telling the Fox News program Sunday Morning Futures. "They are friends of mine. They really are. I get along with all of them. Whether it's Emmanuel or Angela," Trump continued, referring to French President Emmanuel Macron and the German Chancellor Angela Merkel. "I don't know what's going to happen with that deal," Trump said of the 2015 accord, which on October 13 he refused to certify, leaving the pact's fate to Congress. "When they buy those things, it is a little harder," Trump said of French and German commercial dealings with Iran. "I told them just keep making money. Don't worry. We don't need you on this one." European countries have expressed their support for the Iran deal even as Trump has criticized it. Last week, French Foreign Minister Jean-Yves le Drian made clear his country remains committed to the Iran nuclear deal despite Trump's decision, while the country's Defense Minister said that scrapping the 2015 deal would help hardliners and be a step towards future war. Meanwhile, Secretary of State Rex Tillerson told journalists in Riyadh on Sunday that the U.S. is "hoping" European companies and countries "will join the U.S. as we put in place a sanction structure." "Those who conduct business with Iranian Revolutionary Guards, any of their entities -- European companies or other companies around the globe -- really do so at great risk," said Tillerson. Senator Bob Corker, the Republican chairman of the Senate Foreign Relations Committee, recently urged Trump’s administration to work closely with European allies as it develops its new Iran policy. “This is something that can only work if the administration exercises tremendous diplomacy with our European allies,” Corker said.